Wanda Rae West Palmer was born January 22, 1930, in the small town of Lakeside Arizona. 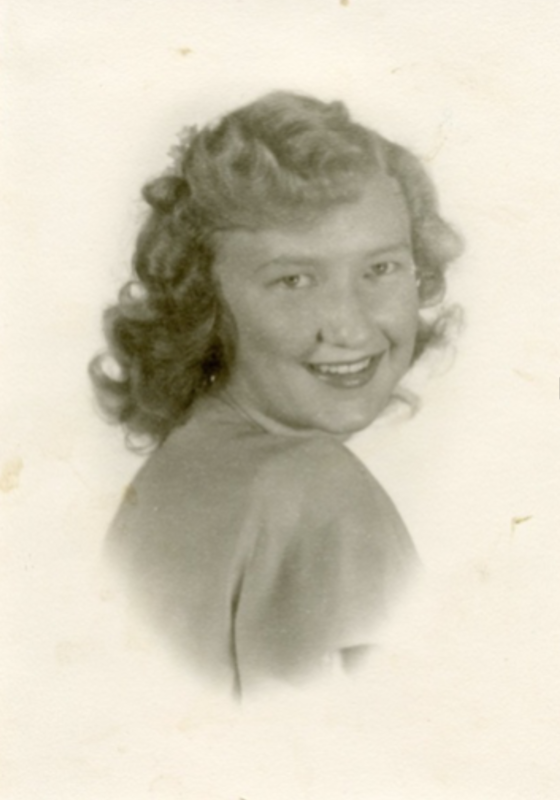 Her Parents, Karl Bates West and Irma Hansen West owned a grocery store in Lakeside, located on main street highway. She lived in a little brick home just South of the store that is still there today. 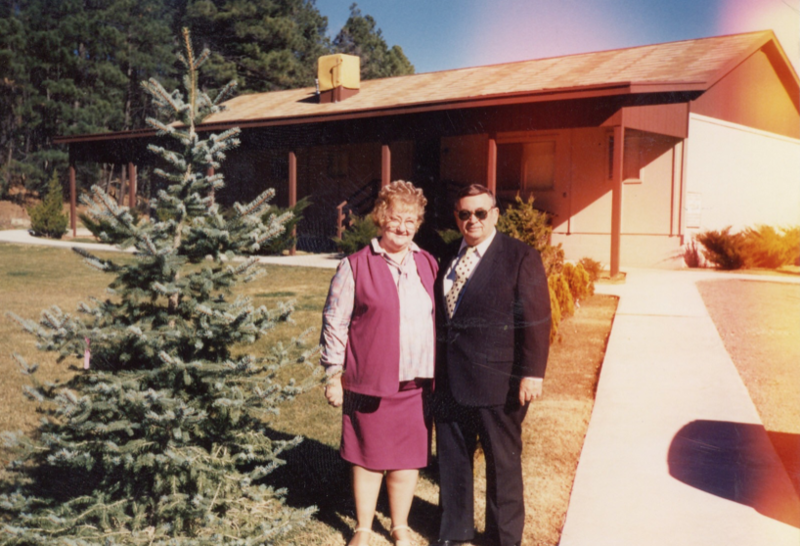 Wanda married Melvin Artimus Palmer in 1949, and in 2014 they celebrated their 64th Wedding Anniversary. They have 8 children Melvin Dennis, Larkin Artimus, Ricky West, Kevin Earl, Wanda Lynette, Brenda Rae, Darin Preston and Ronda LaDawn (Deceased), 40 grandchildren, 60 great grandchildren and still counting! Her love for music was inspired by her parents who were very musical and encouraged her to sing and play piano. “My daddy, when he would have businessmen come in and I was in the room, would have me sing a song, then excuse me and have the meeting. We always were not asked, but expected, to perform at the drop of a hat.” (Church News Aug.25th, 2012 R. Scott Lloyd) It was a rule in their home that if you were sitting at the piano, you were not to be disturbed, as a result she was given time to create and dream. 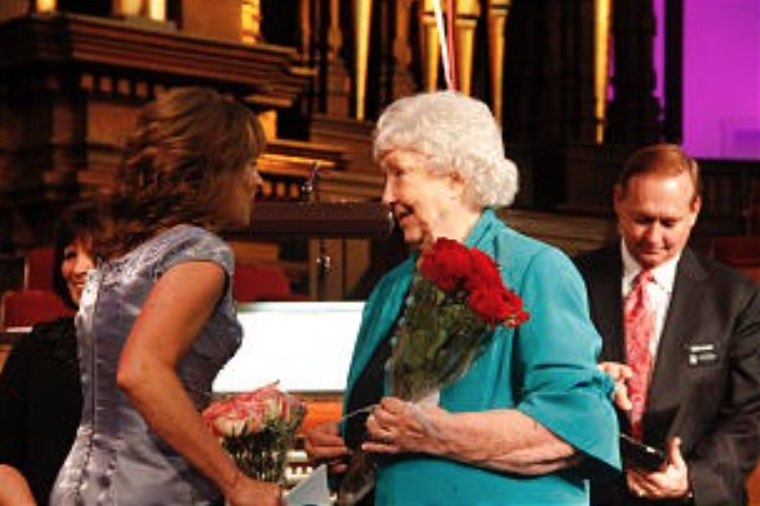 It was during her precious childhood years that her testimony and gift for hearing music began. And felt thy presence there? And I felt my hand in Thine. In High School, Wanda appeared in 3 Gilbert and Sullivan Operettas. She played Tessa in the “Gondoliers”, Pitti Sing in the “Mikado” and the Soprano lead as Mabel in the “Pirates of Penzance”. It was in her first Operetta that she met a cute boy named, Melvin. 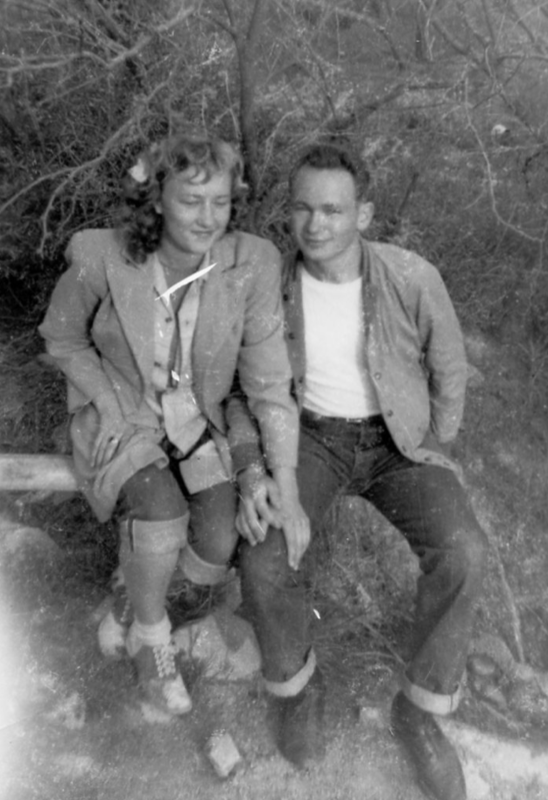 Shortly after High school she and Melvin were married for Time and All Eternity in The Mesa Arizona Temple. 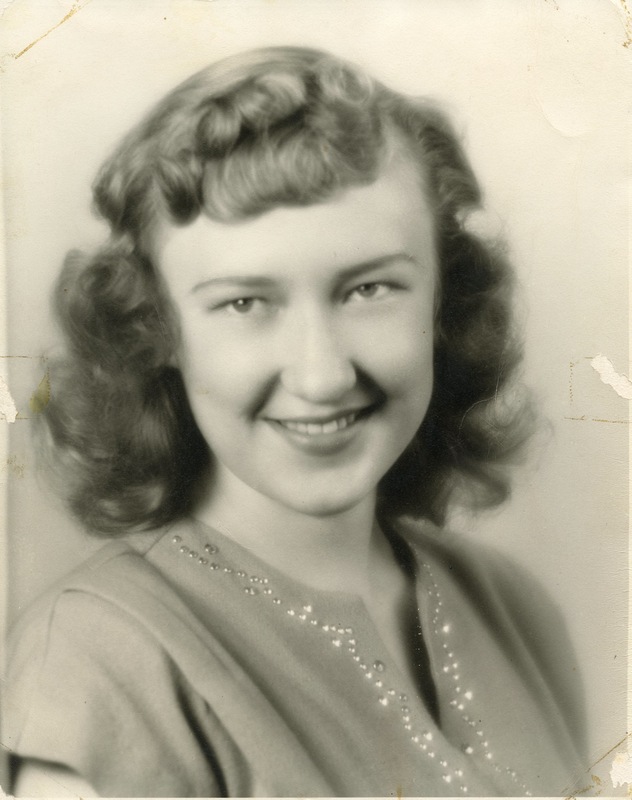 It was while serving as Stake Primary Music Director, Primary Music Director, and Ward Choir Director that Wanda wrote her first song in the Fall of 1958, “Ole Jack Frost”. The following year Wanda wrote “Lynette” for her first little girl after having 4 boys! Lynette was followed by, “I Did and I Does and I Do”, “Four Dirty Faced Angels”, ”Brenda Rae”, “From this day on”, “Enthusiasm”, “Trouble in the Sky”,” and many other original titles. 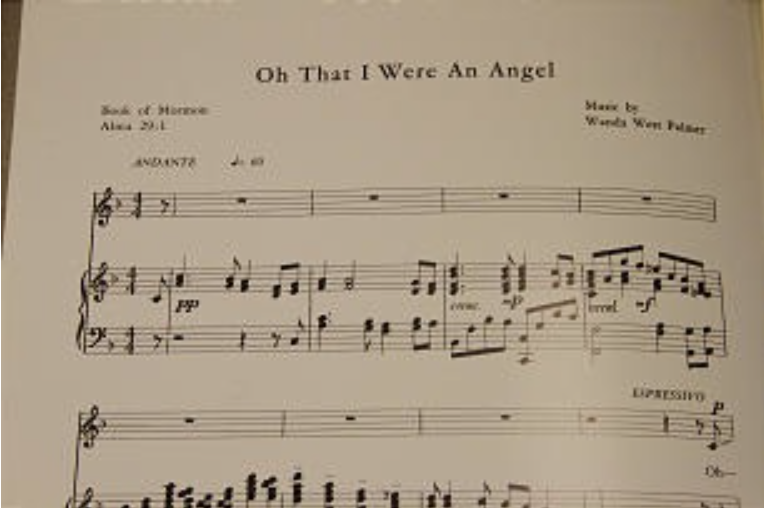 In 1962 Wanda wrote “Oh That I Were An Angel”. This amazing and beautiful piece has inspired and touched the hearts of millions around the world for over 50 years! In 1976, after directing a community production and writing original music for “Our Town Mesa” for 2 years, which had casts of 600 to 2,000 people, Wanda was awarded the “Outstanding Citizen of the Year” for the City of Mesa, Arizona. 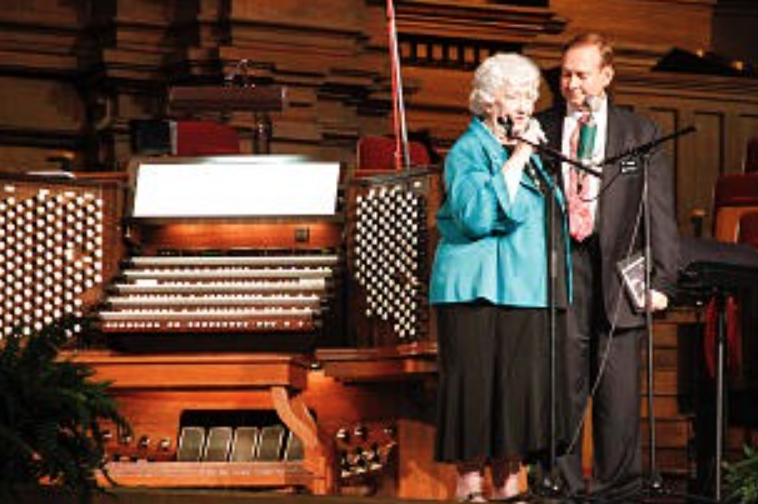 “One of the greatest blessings of my life is to have music that I was requested to write sung in the Mesa Arizona Temple Easter Pageant” said Wanda. The Mesa Temple Easter Pageant is the largest continual Easter Pageant in the World and is now acknowledged as the largest Pageant in the Church of Jesus Christ of Latter Day Saints. The original selections included are “Glory to God”, “Mary’s Lullaby”, “I Must Be About My Father’s Business”, “Blessed are They”, “Suffer Them to Come Unto Me”, “Triumphal Entry”, “My Master Lives”, “Feed My Sheep” and the Finale “I Know He Lives”. 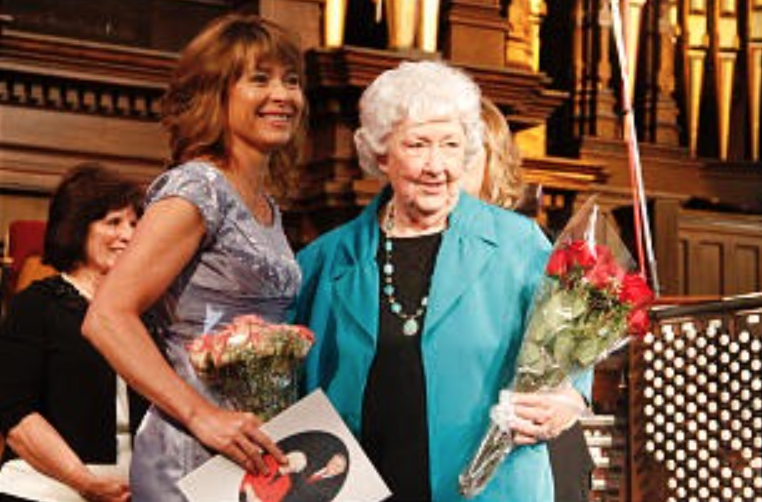 Wanda had the priviledge of recording many of these songs with the London Philharmonic Orchestra, Mormon Youth Symphony, and members of the Utah Symphony, as directed by Robert Bowden. She has written and directed many Road Shows, Melodramas and musical programs. 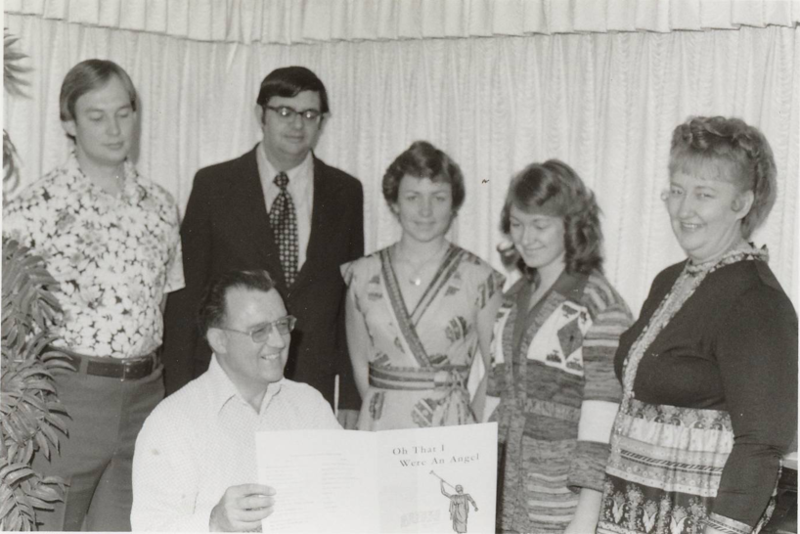 It was a great joy for Wanda and Melvin to work with their son Kevin Palmer and other family members in writing a Pageant about the Mormon Battalion called “A Ram in the Thicket”. 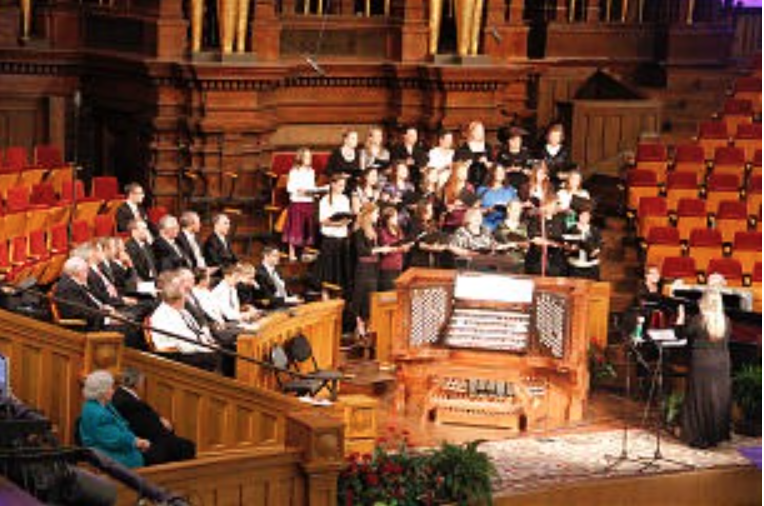 Wanda has also composed original songs for the St Johns Pageant “Take Me Home”, written about the pioneer trek of Jedidiah Grant to the Salt Lake Valley, and the Pageant “Chariots of Hope”, written about the Martin Handcart Company. 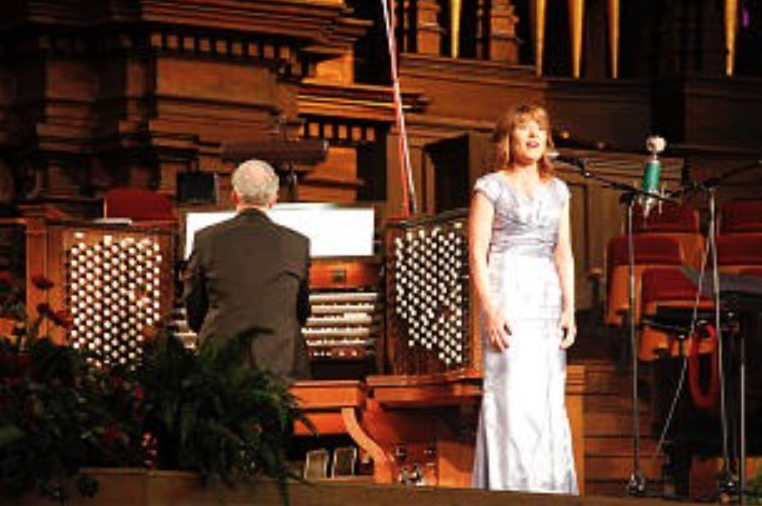 She currently has 4 CD’s, “Wanda West Palmer’s Favorites” performed by the Mormon Youth Symphony and Chorus, “Oh, That I Were An Angel” performed by Michael Ballam, “Mary’s Lullaby” featuring the songs recorded by members of the London Philharmonic Orchestra, and “This Christmas Let Bells of Freedom Ring”, a patriotic Christmas song. 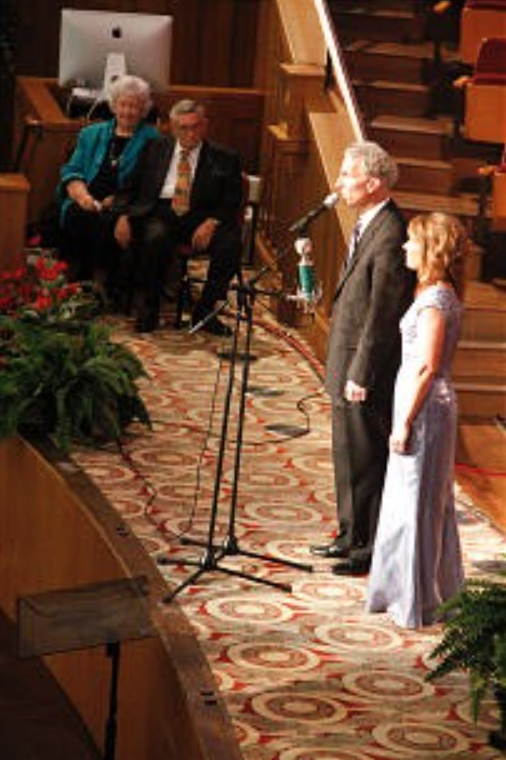 Wanda West Palmer grew up in a home filled with both the gospel and music. 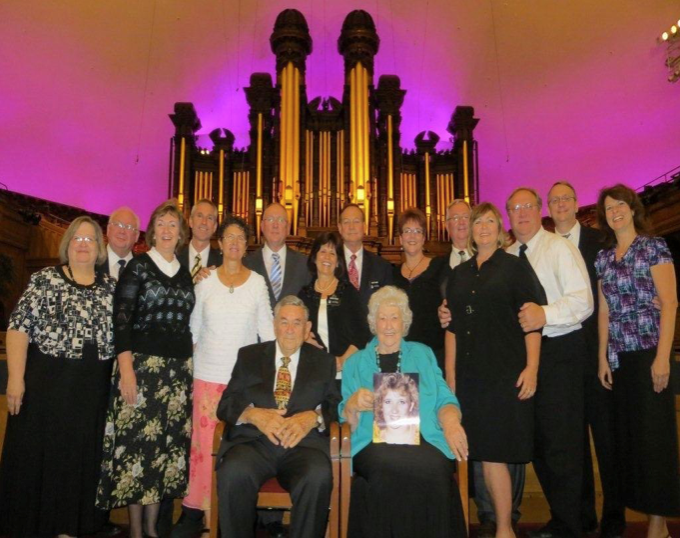 But Sister Palmer, now 82, did more than just sit. Largely self-taught, with some instruction from her elder sister Roxie, she learned enough to play, sing and eventually write her own music. But it was a joy, not a chore, an integral element in her life. Attending Mesa High School in Arizona, she met future husband, Melvin Palmer, while performing in operettas. They have reared five sons and three daughters. 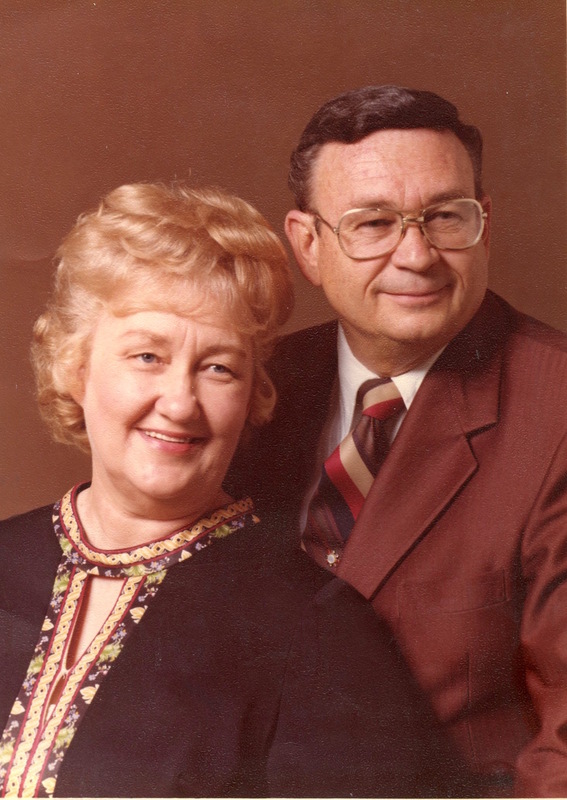 Whether selling groceries or pumping gas, her father would teach the gospel to customers. He brought hundreds into the Church through his direct efforts and perhaps thousands through referrals. On a six-month mission to Karlsbad, N.M., during World War II, he never knocked on a single door, yet influenced the conversion of 65 souls. 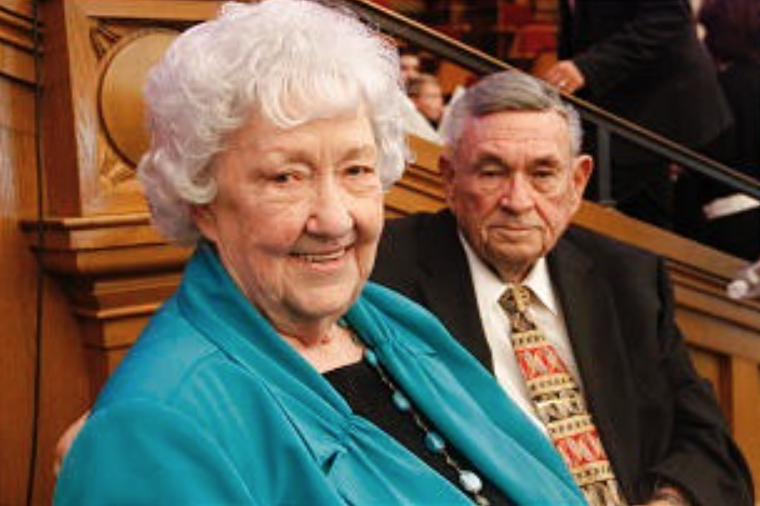 But with her husband in a stake seventies quorum and four sons as prospective missionaries, she felt an urge to do her part to further the work. She sat at the piano and, within 10 minutes, had the basic melody in mind. “I know without a doubt it was a melody that had been written before,” she said. “I would put my hands on the keyboard, but wouldn’t dare touch anything for fear I might hit the wrong note and make the melody go away.” It would take her six months to get the piano accompaniment right. A “special trio” of high school girls began performing the song at missionary farewells in the Mesa area. It spread by word of mouth. In those days before computers and photo copy machines, she set the first copies of the sheet music by hand using rub-on characters and lettering for the musical notation. When Rick returned from his mission to Oregon and Idaho in 1974, he became her publisher, and they distributed the music as best they could. Later, Jackman Music took over the publishing role. Wandas life has been dedicated to the service of the Lord. She has served in many capacities including Ward Choir Director, Ward/Stake Primary, Ward/Stake Youth, Cub Scouts, and Relief Society. 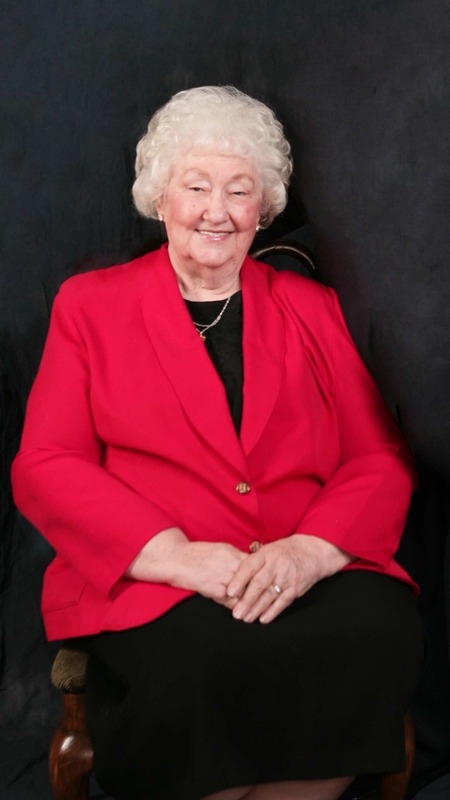 During several years Wanda served in three or more callings at a time and with a baby on her hip! Currenlty She and Melvin are members of the Christopher Creek Branch in the Payson Stake where she has served 6 years as Relief Society President, and over 25 years as the Music Chairman. She believes that because she has always been actively engaged in church service, she has been blessed to be able share her God given gifts and talents. Wanda has never written a song without first getting a testimony of the song. She considers every song, ‘a gift’, for suddenly there it is, as if it had been written before. She believes music cannot be given to you without effort on your part. You must first ‘seek’, ‘knock’ and prayerfully and humbly ‘ask’, before it can be received. The music she has published is only a small portion of the music she has written. It is her goal to record and publish them all, which with all of her fun songs and children’s songs she estimates to be over 250. Wanda and Melvin’s greatest joy is watching their children and grandchildren develop their own talents and to see them achieve. Many of their children, their spouses and their grandchildren have composed and are composing music.